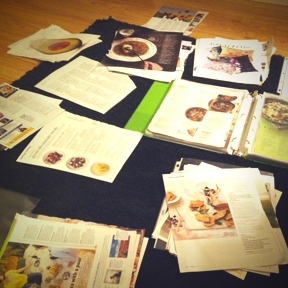 Organizing recipes and places to eat that have been torn out of past and recent months of Martha Stewart Living (yes, I just admitted to that), Sunset and 7X7. This is how I spent my Saturday night. Burning incense and listening to CDs that I made starting back in 2003 through to 2010, conveniently labeled by season and year, or in some instances, emotional state and year. We're so programmed to think that we have to keep pushing, wanting, gaining, working, harder, acquiring more, more, more, into our lives to be something, someone, that it isn't until we actually have a silent moment to be able to stop and see-- and be thankful for what we have, what we've accomplished and have experienced.. that we are humbled. What is it that I've learned thus far in my 31 years of life you ask? It's not the big things, it's the little things; the little differences, the small shifts you inspired in another's thoughts, a beautiful smile, a shared new experience, a genuine gesture, those moments when you had no fear, a moment when everything just felt so right on time, that you will always remember.